This week's post is all about Mathilde and the crazy sort of stuff that she gets up to regularly. 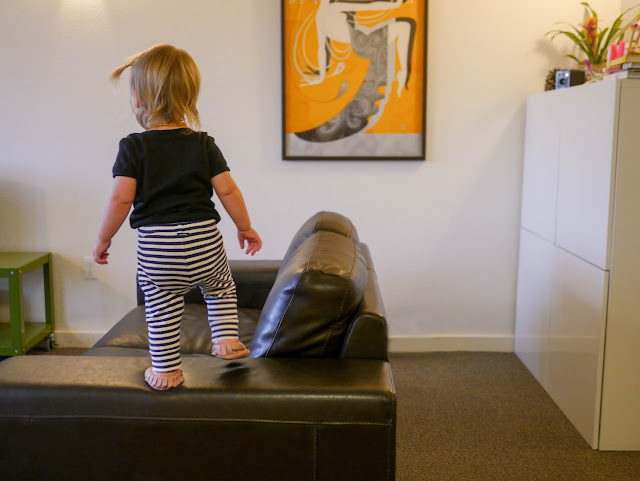 First of all, this little one is a total daredevil. She's constantly climbing on things: the couch, the beds, chairs, tables, ladders, even the window sills if she can reach. Several times a day I catch her standing on an arm of the couch. She giggles and then dives face first onto the cushions. 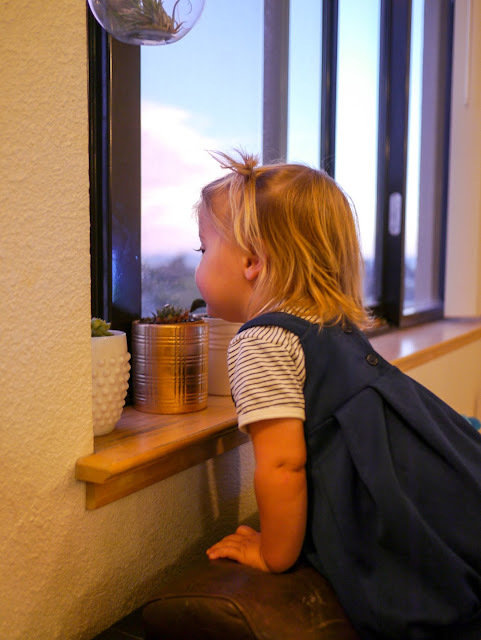 She also loves to stand on a chair in the window so she can watch the traffic below. It's a good thing we had the windows of our fourth floor apartment made a little more secure a while back! It's still pretty daunting when she tries to climb up into the window though. Mathilde isn't just good at climbing, she has got a super strong grip and is amazingly good at hanging off things too. Every night she likes me to hold her up to Ava's top bunk so she can give her big sister a kiss goodnight. When I try to put her back down I find that she has grabbed onto the safety rail and doesn't want to let go. She'll hang there on her own if I let her (always with my hands ready to grab her should she let go). She also loves to hang on play equipment at the park. She can hang onto the side of the pool for minutes at a time during swim class - for those two minutes per class that she doesn't want to try and swim! And every now and then when I'm busy helping one of her big sisters in a public bathroom I'll catch her hanging off the hand rail! Mathilde has discovered a favorite hiding place in our apartment that she likes to sneak into regularly. As we don't own a car, but do use Zipcars regularly, we have a stack of car seats in one of our closets. 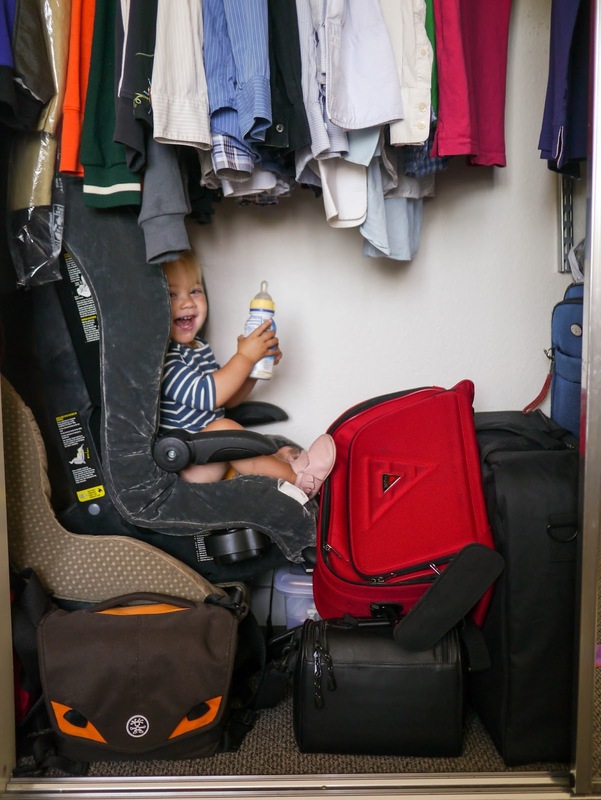 Mathilde likes to slide the closet door open, climb up a pile of luggage, and seat herself in the top car seat. She usually takes a toy or a snack with her. Sometimes she'll even close the closet door from the inside before climbing up. Here she is when I caught her sitting in her hiding place earlier in the week with her favorite drink in hand. Mathilde is a little obsessed with things with wheels. Ok, she's a lot obsessed. 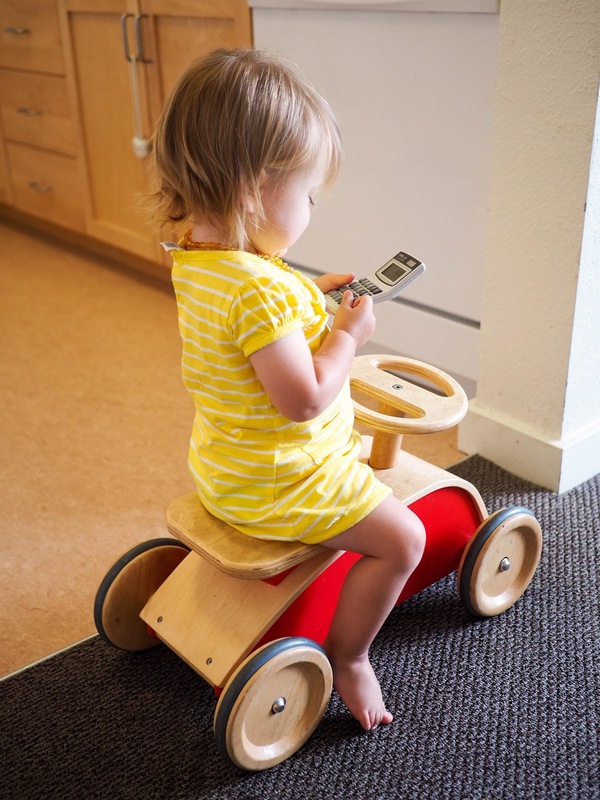 She loves to ride her wooden car (even while texting on a calculator! 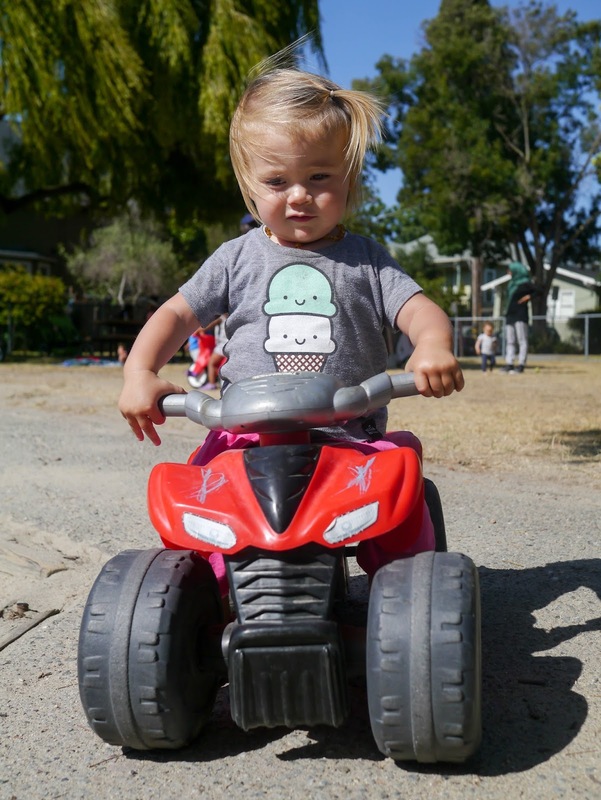 ), she steals her sisters scooters at every opportunity, she heads straight to the ride on cars etc when we visit the playground, and she has taken to pushing a toy stroller everywhere! 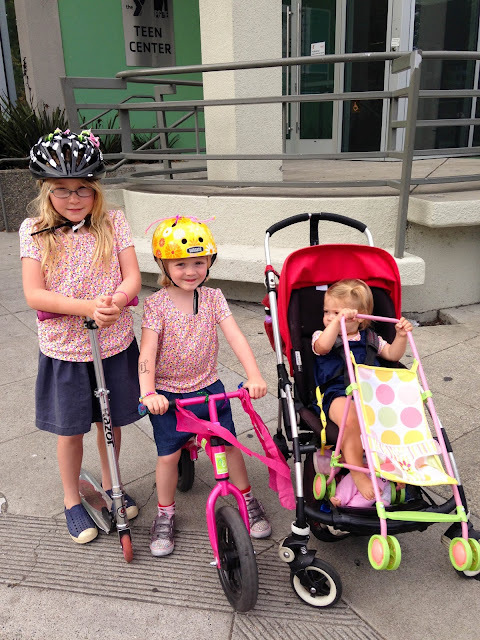 The toy stroller has started going out with us when we go to karate, swimming or to the park. 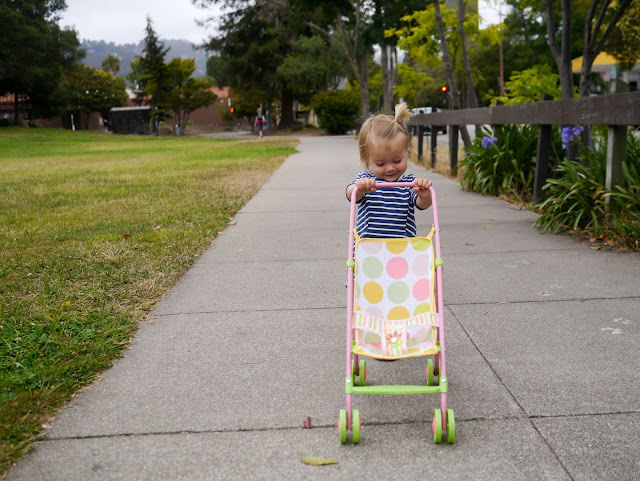 Usually I just fold it up and put it on top of Mathilde's stroller, but sometimes Mathilde doesn't want to let go of it and holds onto it the whole way there. Of course, if she had her way she'd just push the stroller everywhere, but that would be tediously slow for everyone else! Mathilde likes to help me out around the house. Toddler helping is usually more of a hindrance than anything else, but there are a few little jobs that she really enjoys so I'm happy for her to help. The first is the dishwasher. She loves to unpack it, repack it, turn it on, turn it off... Not always at the right time mind you! I recently had to install a lock as Mathilde kept opening the dishwasher to take out or put in dishes. Unfortunately the lock doesn't stop her from turning it on at random times - or turning it off when it's supposed to be running - so I'll have to look into yet another lock for that. 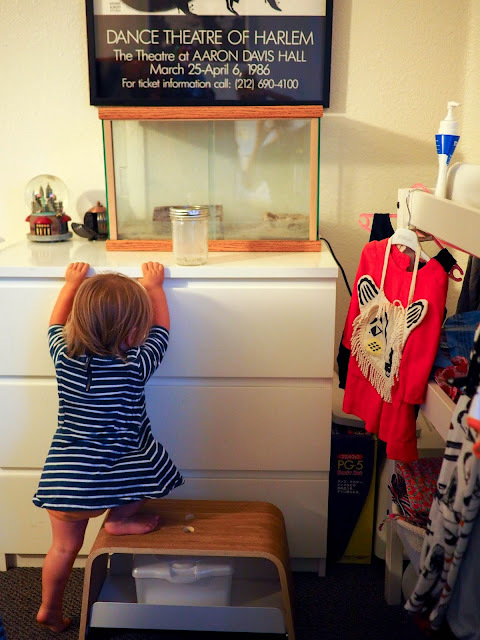 The other job that Mathilde likes to help with is feeding Cookie, Ava's gecko. Mathilde knows that we keep the crickets that Cookie eats under the kitchen sink. I keep this cupboard locked because it's also where the dishwashing tablets and trash live, but when it's time to feed Cookie I open it up for Mathilde to get out all of the supplies. We transfer the crickets, ten per day, into a jar in which we also add two vitamin supplements. Mathilde tries to help me get everything ready. She's not at all scared of the crickets and usually shoves her hand into their box before I can stop her! I don't trust her to handle the crickets though so I always have to take over. 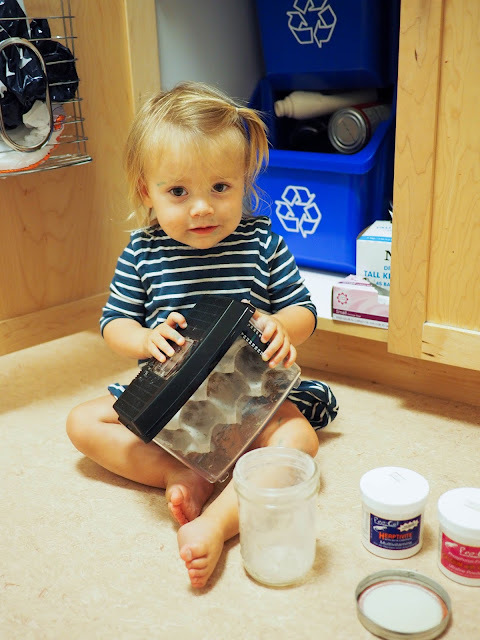 Mathilde's job is to hold the jar, put the lid on when we're done, carry the cricket jar to Cookie's vivarium, and then put everything away under the sink when we're done. In the last month Mathilde has grown tall enough to reach a lot of things that were previously just out of reach. Most namely, the door handles in our apartment, the doorbells in our apartment building, and the emergency telephone button in our elevator. There's a lot of cheekiness involved when it comes to that last one. She likes to pretend to press buttons while we're in the elevator and then just as she's about to walk out she rushes back over to the button and jabs her pointing finger in the telephone button before running out into the hallway while laughing. This little one is seriously cheeky! 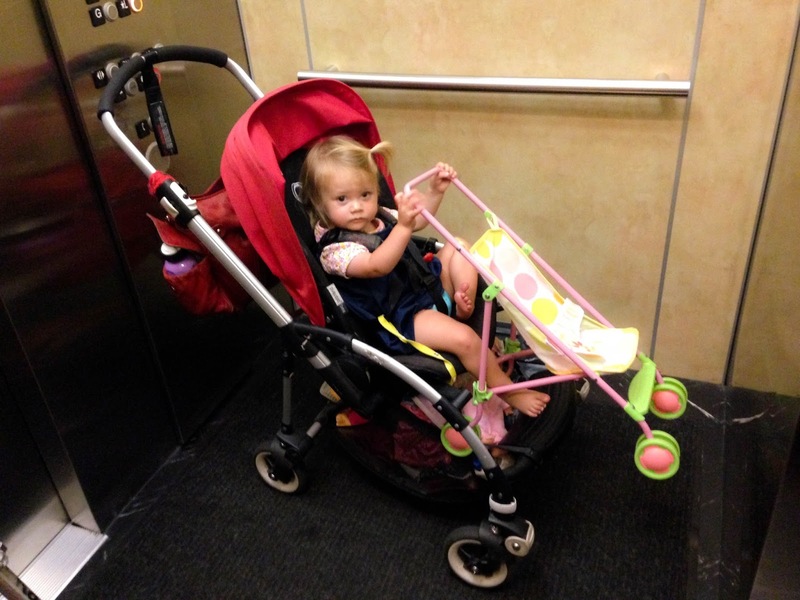 I've learned to keep my hand over the telephone button until she is completely out of the elevator now. When it comes to the doorbells, luckily she only likes to press ours. I'm sure the day will come though that she wants to press every other doorbell on the way to our apartment. And as for the door handles, well as of this past week she is now strong enough to push our front door open so I've got to keep an extra eye on her at all times in case she tries to go out into the hallway to play. Because of the fire codes in California our apartment door can't be locked in a way that prevents children from being able to open it in an emergency. While that's good in the case of an emergency, it's kind of crappy in every other case. Lola also went through a phase of constantly trying to go out the front door so I guess it's to be expected. Mathilde's most favorite thing to do, above everything else, is play with her big sisters. She follows Ava and Lola around like a little puppy dog and copies them whenever she can. 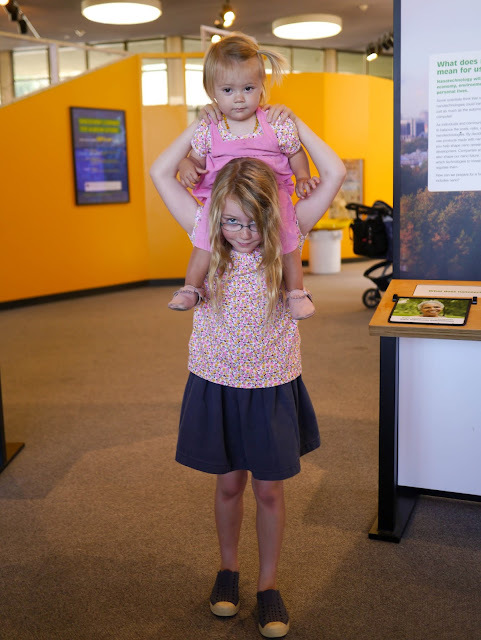 She's lucky to have two wonderful big sisters who dote on her just as much as she looks up to them. I can't believe how big my little one is already. She's definitely no longer a baby. She's an independent, strong-willed and cheeky little toddler - who thinks she's a big girl like her sisters!